DCSS offers three-day and five-day lessons from 9:30 a.m.-4:00 p.m.to adults of all ability levels. 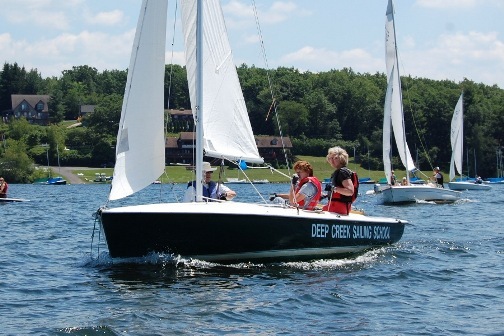 Summer 2019 classes will be held at Deep Creek Yacht Club at Deerhaven. The lessons include classroom chalk talks, on-the-water instruction in Flying Scots, and a capsize demonstration. 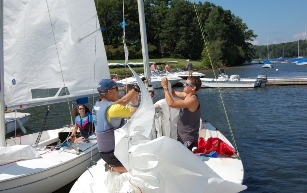 Beginning sailors will learn the points of sail and basic boat handling. More advanced sailors will learn the use of the spinnaker and sailboat racing. Skipper and crew couples, as well as singles, are welcome. You are welcome to bring your own Flying Scot or use one of the three boats provided by the sailing school. Lessons are taught by U.S. Sailing certified instructors and follow U.S Sailing prescribed safety protocol. All sailors must wear life jackets at all times on or near the water. Be sure to check out our “what to bring” section. Classes both weeks will be held at Deerhaven. Practice boat speed, sail trim, tactics, starting, crew work, and more. Great preparation for the Sandy Douglas regatta. Check back for more information. Private, three-hour lessons can be arranged for adults 16 and older. Learn more.